ANGLIA Shandy in collaboration with RAM Entertainment and youth online portal, Yuberactive, presents The Great Magician’s Apprentice Search to discover top talents in the art of magic and mentalism! The search is being held in conjunction with the release of The Great Magician in Malaysia, starring award-winning actors Tony Leung and Sean Lau Ching Wan. Participants stand a chance to win prizes worth up to RM10,000 including an apprenticeship with Malaysia’s leading mind magician, Zlwin Chew. Want to be his assistant? 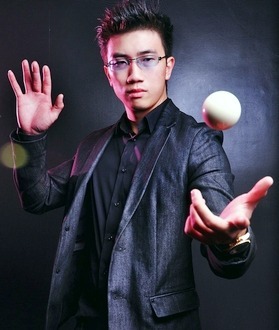 : Stand a chance to win an apprenticeship with mind magician, Zlwin Chew. Zlwin is a well known practitioner of art magic and mentalist who has the ability to bend a fork by using his mental physic force. Supported by Malaysia’s leading online youth marketing portal Yuberactive, the search is open to all Malaysians, 18 years and above who are prepared to enchant and dazzle the audience with their magical presentation. Each participant will have to submit a two-minute video of his/her magic acts, ranging from simple card performances to complex disappearing acts on www.yuberactive.com before Dec 28. Ten finalists will be shortlisted and invited to perform at The Great Magician’s Apprentice Search showdown on Jan 6, 2012 during The Great Magician Star Tour meet-the-fans session. At the final showdown, a grand prize winner will be selected to walk home with an apprenticeship with Zlwin, a chance to perform at Zouk KL with Zlwin, an opportunity to shoot a magic video with Zlwin, a set of magic props and learning materials worth RM1,000, a Samsung Galaxy S II smart phone, exclusive The Great Magician merchandise worth RM200, and four movie premier tickets to the movie The Great Magician. The other finalists will also receive The Great Magician merchandise worth RM200 each, two movie premier tickers to The Great Magician and a set of magic props and learning materials worth RM500 each. Entries for The Great Magician’s Apprentice Search will be judged by representatives from RAM Enter-tainment and Zlwin based on creativity, originality and showmanship. Public voting will account for 20% of marks awarded to participants. The Great Magician is set to hit cinemas nationwide in Malaysia coming Chinese New Year, on Jan 12 .